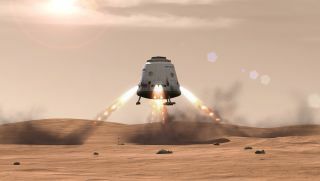 SpaceX's Dragon capsule – now in use to resupply the International Space Station – could be modified to perform a Mars sample-return mission, researchers say. Sending astronauts to the surface of Mars has been a longtime goal for NASA and other space exploration agencies. That Martian goal takes center stage in a Washington, D.C. conference, and you can watch it live online. Nearly 500 scientists are descending upon Washington for Humans 2 Mars Summit 2014, a three-day conference beginning Tuesday (April 22) that aims to explore how to send humans to the Red Planet. The Humans 2 Mars summit will host a wide variety of panels, with topics ranging from American competitiveness in space to the daunting challenges of keeping astronauts alive on the harsh surface of the Red Planet. The conference is hosted by Explore Mars, a nonprofit group working toward a goal of sending astronauts to Mars within the next 20 years. NASA chief Charles Bolden will give the summit's keynote address on Tuesday morning. In a blog post last week, Bolden called the recent extension of the International Space Station to 2024 one of the key steps NASA is taking to prepare crews for Mars exploration. NASA's bold plan to capture an asteroid for astronaut exploration, and the forthcoming test flight of the Orion deep-space spacecraft in 2014, will also be great teaching tools, said Bolden, who is a former NASA astronaut and space shuttle commander. "Our stepping-stone approach includes a plan to robotically capture a small near-Earth asteroid and redirect it safely to a stable orbit in the Earth-moon system where astronauts can visit and explore it," Bolden wrote in a blog post last week entitled "The Path to Mars." "Our asteroid redirect mission will help us develop technologies, including solar electric propulsion, needed for future deep-space missions to Mars, as well as other NASA and commercial activities," Bolden added. Manned Mars exploration received greater attention in the past year because of two private organizations looking to send people there themselves. The Mars One colony project is drawing up plans for one-way trips to the Red Planet to establish a human settlement on the Martian surface. Mars One officials have said they hope to launch the first robotic support missions to Mars by 2024. Meanwhile, the Inspiration Mars Foundation aims to launch two astronauts on a Mars flyby mission by 2021, and then return the crew to Earth. For more information and session details on the Humans 2 Mars conference, visit: http://h2m2014.exploremars.org/.